That’s an actual quote from an actual Cubmaster following his pack’s annual Pinewood Derby race held last week. If you’re a Cubmaster, I’m sure it has happened to you as well. The trophies are all lined up, and the boys all dream of taking one home. The cars are carved, painted and weighed. Then the race is on. A wheel falls off, or wobbles, the masterpiece goes skittering off the track or scrapes along to the finish line, and the car comes in last. Hopes turn to disappointment – sometimes more than a tender young heart can bear. I’m fortunate that, during my time as Cubmaster, I don’t recall more than one or two boys brought to tears by failed expectations. Most of the boys had a great time, and some were actually more interested in the pizza and bug juice than they were in how their den race went. But overall, Pinewood Derby isn’t without its pitfalls and controversies. In a program where the aim is to do your best, it’s odd to have a signature event where there are inevitably going to be losers. Although he says “[t]he crafting of the car was second to the crafting of character that comes by way of hard work and seeing something through to the end,” author and blogger Kyle L. B. Morey details some of his experiences with his son and his perceived shortfalls of Pinewood Derby. Morey offers an alternative activity – Raingutter Regatta – that many packs also conduct and gives reasons why he thinks it’s superior to the classic car race. One of the big stumbling blocks is the need to have access to power tools, or at least a good set of hand tools. Some packs have their own tools. In others, a parent or two may have a well-equipped wood shop and offers it for others to use. And while the object is for the parent and son to work on the car together, most of the dangerous work still has to be done by an adult. This leads to issues quite frequently, especially in single-parent homes where the mom doesn’t know a miter saw from a meat grinder, doesn’t know anyone who can help, and doesn’t want to ask. 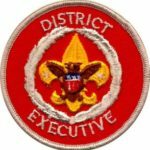 Boys have quit Cub Scouting (or, often, parents pull their sons out) because they didn’t have access to the resources that other boys had. Pack leaders need to be aware of this possibility and offer help however and wherever they can. Indeed, many packs have “build nights” where these resources, and helping hands, are available. Still other hard feelings are formed when the parent doesn’t understand the rules. Most Pinewood Derby races require that the official BSA kit be used, but you can buy unofficial “Pine Car” kits in many hardware and hobby stores. A parent who doesn’t know the legal way to proceed risks his son’s car being disqualified if, say, the wheels aren’t official or the dimensions of the car fail to meet specifications. Another source of trouble can be parents who have more invested in their son’s car than he does. The only Hollywood movie about Cub Scouting, Down and Derby, was about cheating and parental overinvolvement in what is supposed to be for the boys. Bryan Wendell wrote about this phenomenon in Scouting Magazine’s blog a couple years ago. The auto industry is centered in the area where I live, and many of the dads are engineers for companies that make real-life cars. They have access to machine tools, wind tunnels and paint booths. It can sometimes be obvious if a Pinewood Derby car has more of a professional look to it than others. My experience, though, is that aerodynamics play little or no role at the speeds the cars reach on the track, and that a block of wood with four properly-aligned wheels has won many a race against those slick wedged beauties with the spoilers and fins. The big loser in some of these cases isn’t the car – it’s the Scout who lost out on the opportunity to work with his hands and his dad, mom, uncle, aunt or grandparent to create something that’s his. Every boy a winner. This may mean awarding the dreaded “participation trophies”, but maybe take the high road by having them read I Did My Best or something similar. The last shall be first. The current Cubmaster of our pack created a new award in each den this year: Safest Car. This is a great way to put a positive spin on the car that ran the slowest. He awarded trophies as big as the First Place ones, and these had a fire engine at the top where a race car would normally go. A pep talk. Explain to the boys that the real adventure was dreaming up your car and making it the best you can. Running fast is just one aspect. Looking great – or looking like your own design – is every bit as important. The art of distraction. Have food, prize drawings, another track to run cars on, or other sideshow activities to keep the race from being the only thing. You are your own competition. Instead of comparing how a Scout’s car runs against others today, encourage him to find ways to make next year’s car run faster or better. That way, he’s competing with himself and learning to push himself to be better than he was last year. 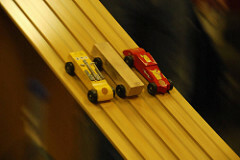 Pinewood Derby is a fun event but it’s not without its pitfalls. Take the high road and help your Scouts have a great experience. And leave a comment with your own thoughts and experiences. Great article, the question I have is, what’s the best way to streamline everything. We have two tracks running three races each time, and it still took almost three hours. There was a lot of confusion, and I know it was painful for parents to watch. Our timing system can be connected to a computer to log times, but right now we do everything by hand. I know there is software out there, does anyone have any experience with them and can I connect two tracks to the computer?